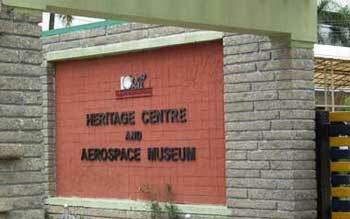 Heritage centre and the Aerospace museum also known as Hal is a paradise for Aviation enthusiasts and history buff. Exploring this lovely museum is great entertainment as well as enlightening. Hindustan Aeronautics Limited (HAL) Heritage Centre & Aerospace Museum is located in Bangalore and this museum is very first of its kind. This museum was established in the year 2001 and is situated at the junction of HAL Old Airport Road & Basavanagar Road, which is about 17 kms from Bangalore city railway station. This museum sprawls across an area of 4 acres of lush greens. The infrastructure of this museum is modern and is well planned. The museum consists of two major halls. One of the hall displays photographs that shows the gradual growth of aviation in each decade from 1940 till date. The history of HAL and the Aviation Industry in India is truly fascinating. Next to this hall is the model hall that flaunts the motorized cross sections of various models of Aero Engines. This room even displays the real engines including Garret, Adour and Orpheus can be seen here along with Ejection Seat with Parachute; and Pushpak & Basant Aircraft. The outdoor arena displays Aircraft such as MARUT, MIG-21, HT-2, KIRAN, CANBERRA, AJEET, LAKSHYA (Pilotless Target Aircraft) and lot more. It’s a life time memorable thing to see all these giant aircrafts. Especially Kids and students love a lot to visit this museum. There are also models of PSLV and PSLV heat shield displayed here to make the visitors know the forays made by the country in space technology. The Audio and video facilities helps the viewers to know more about Aero motors, their function and lot more. The true motion stimulators that helps the visitors to experience the feel of a pilot in ride is truly amazing and mind - blowing.